EN19 Rectangular Pipes, EN19 Seamless Round Pipes, En 19 piping material suppliers, Buy at Never Before Price!!! EN19 pipes also known as AMERICAN SAE 4140 Pipe. EN19 seamless pipe is a high quality alloy steel with tensile strength. It is a high quality medium carbon. EN19 steel pipe is one steel grade in BS 970-1955 standard, which is specification for wrought steels for mechanical and allied engineering purpose. With a combination of good ductility and shock resistance, EN19 seamless pipes are suitable for applications with very high loading such as engine gear boxes. EN19 Rectangular Pipes is a very popular material in the automotive sector it is possible to machine the material extremely accurately. EN19 Seamless Square Pipes material is also in demad by Oil & Gas industry. EN19 pipe is a prime choice because of its high strength. The EN19 Seamless Round Pipes equivalent grades are AISI 4140 Round Pipe, DIN 1.7225/42crmo4 Pipe. AISI 4140 steel seamless pipe is an engineering alloy steel containing chromium and molybdenum. EN 19 pipes comes under the class of low alloy steel. EN 19 seamless pipe has high fatigue strength, abrasion and impact resistance, toughness, and torsional strength. EN-19 pipes can be heat treated in a number of ways to give it a combination of properties. Oil Quenched & Tempered Hardenss is 28-34 HRc. EN-19 seamless pipe Annealing delivery hardenss is less than 250HB. En 19 piping material has high tenile strength of 850- 1000 Mpa. EN19 seamless pipe grades are BS 709M40, DIN 42Cr4Mo2, IS 40Cr4Mo3 and EN is EN19. The Chemical Composition of EN19 is that of Silicon, Si Max 0.35%, Phosphorous, P Max 0.05, Carbon, C Max 0.45%, Molybdenum, Mo Max 0.40%, Sulfur, S Max 0.05, Chromium, Cr Max 1.50% and Manganese, Mn Max 0.80%. 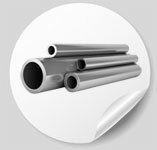 EN19 is a type of steel that is of a high quality and it is high tensile steel. It has shock resisting properties, good ductility and it is also resistant to wear. No matter what your need in EN19 seamless pipes, you can be sure that we can cater to your every need. After all, it is not for nothing that we have the status of being a PED approved manufacturer of EN19 seamless pipes in India. Prices on all other material not listed will be provided on request. All prices in this Price List exclude V.A.T.